Capsule Summary: Hawkeye tries to use wine to get a date, Charles tries to get his hands on more of the same wine, and Colonel Potter tries to acquire a useful drug banned by the Army. 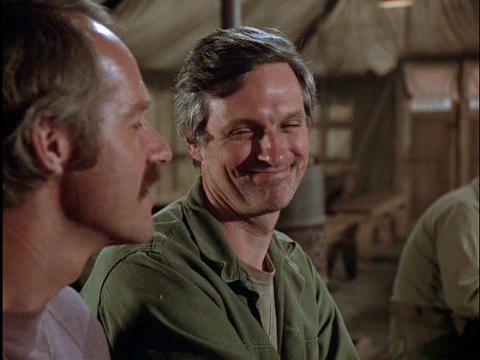 This episode–specifically Hawkeye’s storyline–might have worked better had it taken place during the first three seasons of M*A*S*H. Back then Hawkeye was far more believable as a womanizer. By Season 9, both the character and the series had shifted in tone so it felt out of character for Hawkeye to resort to such tactics. On the other hand, part of me feels Hawkeye’s storyline never would’ve worked, not even during the wacky early years of the show. I get that the point of the storyline is to highlight how Hawkeye can be a real cad at times–and he does get his comeuppance in the end–but it was still over-the-top. I’m not sure there was any point during the show’s run where him trying to entice a nurse with a bottle of wine wouldn’t seem sleazy. Maybe it would have been easier to watch had B.J. been more disgusted by Hawkeye’s action. True, he did call Hawkeye depraved and suggested the scheme was insulting to the nurses. But he didn’t try to talk Hawkeye out of going through with it. He almost seemed amused (or perhaps bemused). While I appreciate how all three storylines intertwined to some degree, I would have preferred just two storylines. I think the curare storyline was very interesting, much more than Charles hoping to acquire fancy French wine, and wish it had been expanded. Both Charles and Klinger were involved in the curare storyline so there was no real need for a third storyline. I’m sure the plot point about curare being banned by the U.S. Army was based on reality but I haven’t been able to find anything online explaining exactly how curare was used during the Korean War. Supposedly it was never approved for use and yet in Season 6’s “The Light That Failed” Charles nearly killed a patient by accidentally giving him curare, so the 4077th was using it at one point. While Hawkeye is reading the three responses he received in the mess tent, B.J. is playing cards. There is a half-eaten doughnut on the table. I love doughnuts so they always catch my eye when watching M*A*S*H. I wonder if Mike Farrell was actually snacking on a doughnut while shooting this scene or if it was placed there as a prop. Watch closely and you’ll see everyone turning to stare at Klinger and Potter as their “Just Married” jeep drives off, including a patient in a wheelchair. It’s gives the scene a little more life. Guest star Margie Impert made a one-off appearance in this episode as Nurse “Sweet Preserves” Palmer. Seen among the group of nurses who ruin the wine and sleaze party are actresses Judy Farrell, Jan Jorden, Kellye Nakahara, Shari Saba, Jo Ann Thompson, and Gwen Farrell. It’s too bad Canadian company clerk Turnball never met Radar. They were probably the only people to ever enjoy eating at the 4077th mess tent. A very average episode. The Hawkeye plotline is mildly amusing but improbable given this era of the show. It’s just too overtly sleazy; Hawkeye was a womanizer, no doubt, but something about this scheme, I don’t know, it almost comes off as out-of-character to me. The curare plot proper isn’t bad, but kinda gets lost in the shuffle, IMO. Seems like a missed opportunity to me. Not a great episode, not a bad episode. Like I said, it’s just very average. Turnbull: Wow. Real powdered eggs, eh? This porridge looks first rate. Thank you so much for saying that! I thought the same and I’m not even Canadian. At the risk of Frank Burns level of paranoia, was there a little product placement in this episode or is it a coincidence that Sweet Preserves turned out to be Lt Palmers? Or was Lt Smuckers just too busy washing her hair? The actor who plays the Canadian clerk’s accent is horrendous. He keeps throwing in “ehs” at the end of every sentence. There are major differences been Canadian and American accents but apparently the casting director didn’t know that. Hawkeye’s desperate attempts to con a nurse, any nurse into “dating” him was very creepy. His wolfish grin was gross and the way he drooled over those letters made my stomach turn. Apparently a night with Hawkeye isn’t very memorable because even Margaret was disgusted at the idea of “dating” Hawkeye.. again. It was funny that every woman he approached in the mess tent seemed older and more homely than the last. Perhaps they were trying to show how desperate he was becoming. The irony is that the writers have all said that after his tryst with Margaret they consciously made Hawkeye less of a womanizer and more sensitive to women. Really? When BJ was getting ready to operate on the soldier who was fighting him, the nurse says, “I can’t get him under any deeper with just nitrous.” That inspires Potter to trade for something stronger. It’s completely ridiculous that the show would imply that they were operating on people awake enough to be able to fight the doctor. They said earlier that the only difference was the muscles still move during surgery. The writers apparently thought they had to show us how desperate the situation was by misrepresenting the issue with nitrous. It was a silly and ridiculous scene. Finally, can you really put wine in the radiator? Isn’t it loaded with natural sugar not to mention alcohol that would ruin it? I was always taught sugar in a gas tank is bad for it. What about a radiator?